[Image: Thesis project by Vincenzo Reale, from a course taught by Alessio Erioli at the University of Bologna; photo by Alessio Erioli]. 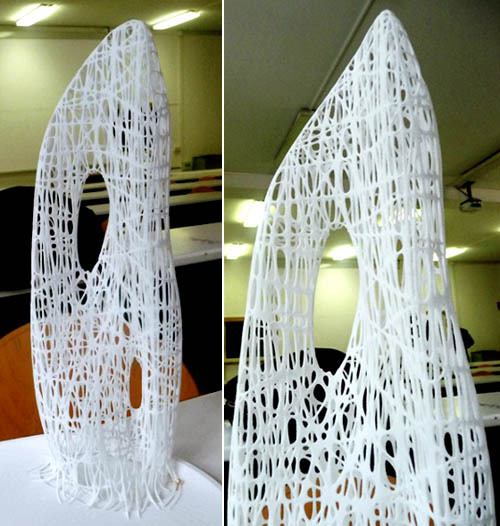 Here are two 3D-printed thesis projects from a course taught by Alessio Erioli at the University of Bologna; above you see work by Vincenzo Reale, below work by Riccardo La Magna. I have to admit to being utterly blown away by the formal possibilities of 3D printers, and these projects only make that obsession more extreme. [Image: Thesis project by Riccardo La Magna, from a course taught by Alessio Erioli at the University of Bologna; photo by Alessio Erioli]. For one or two more images of these and other thesis projects, check out the Flickr stream of Alessio Erioli, where I originally saw these photos; for more on the future of (an admittedly different kind of) 3D printing, check out the recent, awesome article by Tim Abrahams in Blueprint Magazine: "In a small shed on an industrial park near Pisa is a machine that can print buildings," we read. The machine itself looks like a prototype for the automotive industry. Four columns independently support a frame with a single armature on it. Driven by CAD software installed on a dust-covered computer terminal, the armature moves just millimetres above a pile of sand, expressing a magnesium-based solution from hundreds of nozzles on its lower side. It makes four passes... The system deposits the sand and then inorganic binding ink. 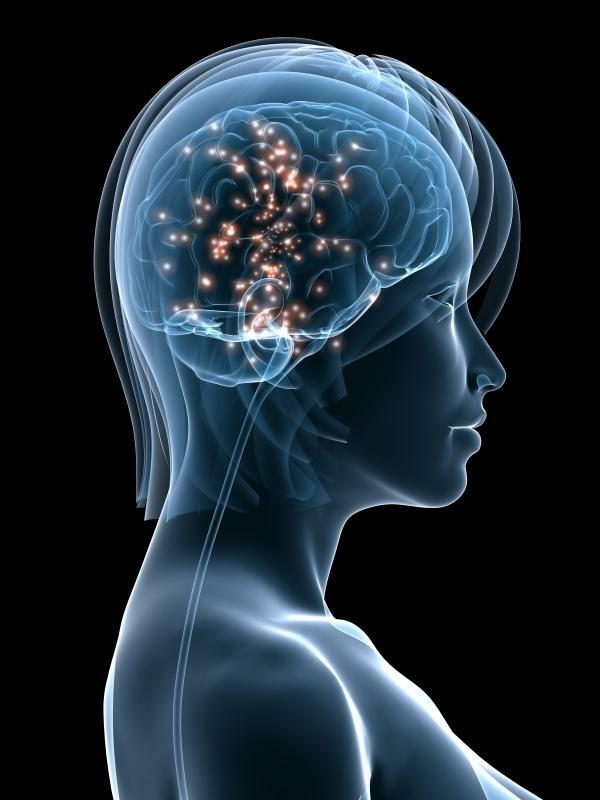 The exercise is repeated. The millennia-long process of laying down sedimentary rock is accelerated into a day. 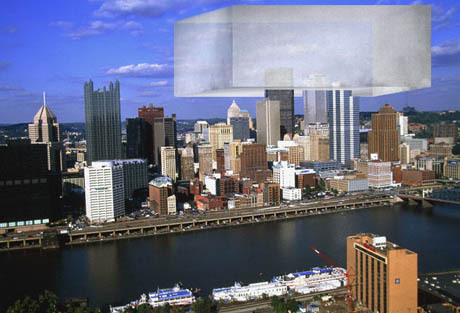 A building emerges. This machine could be used to construct anything. 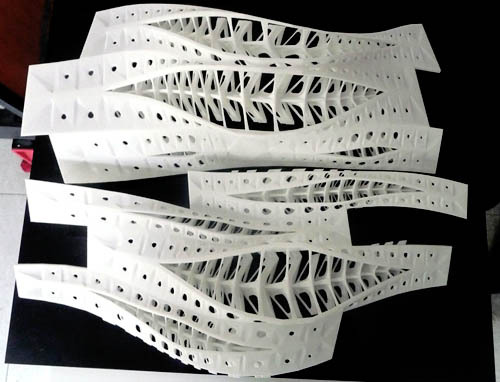 Mimicking geology, we might forego architecture altogether and print new tectonic plates. Print earthquakes and mountain chains, archipelagoes at sea. 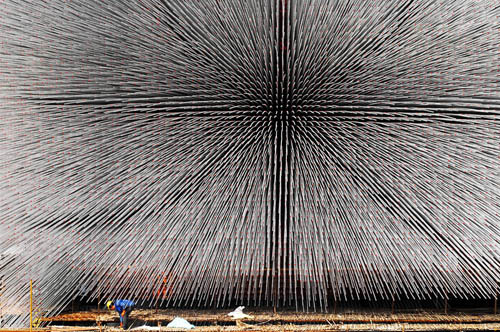 [Image: Thomas Heatherwick's "Seed Cathedral" at the 2010 Shanghai World Expo; photo by Reuters/China Daily, via The Big Picture]. I have to admit that, however over-exposed this building might be, it is one of the coolest architectural constructions I've seen in a long time—and while I say that in the most superficial way imaginable, i.e. 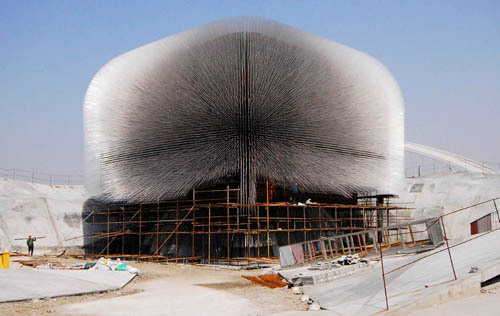 I just think it looks really, really cool, this structure, the so-called "Seed Cathedral" by Thomas Heatherwick, under construction in Shanghai for this summer's 2010 World Expo, has an amazing ulterior motive: at the end of every one of the 60,000 transparent acrylic rods that you see fuzzing outward into the sunlight are the seeds of plants. 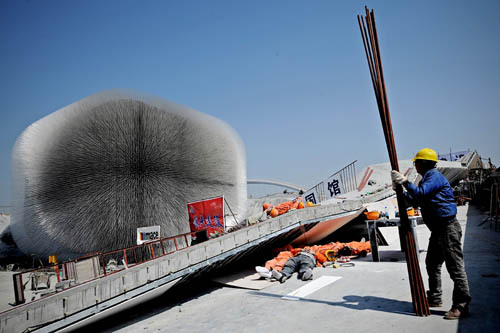 The result looks very much like an expansion of Heatherwick's earlier work Sitooterie II, but the final design incorporates seeds from the Kew Millennium Seed Bank project. 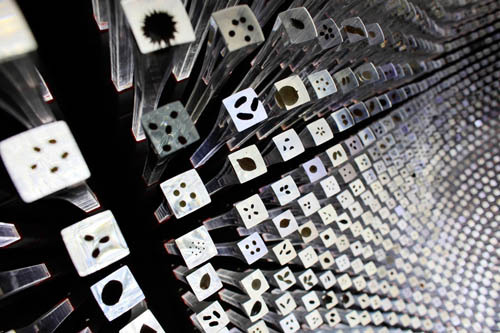 From the New York Times last autumn: "Heatherwick and his team worked with Kew’s Millennium Seed Bank partnership to showcase Britain’s commitment to conservation. 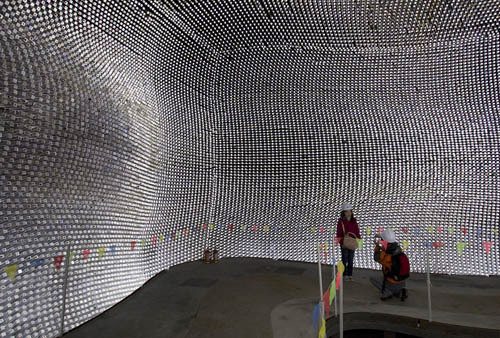 They encased thousands of seeds in the ends of the transparent rods, creating a larger-than-life catalog of the plant species that contribute to national and global conservation programs, in a veritable cathedral of seeds." 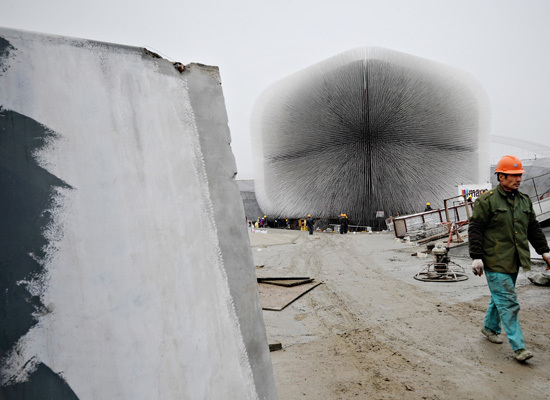 [Images: Thomas Heatherwick's "Seed Cathedral" prepares to open in Shanghai; photos by Philippe Lopez/AFP/Getty Images; STR/AFP/Getty Images; and AP; all via The Big Picture]. This not something new and is a "dream" shared by many (I think here about François Roche & co, Gramazio Koller, recently Greg Lynn, etc.). 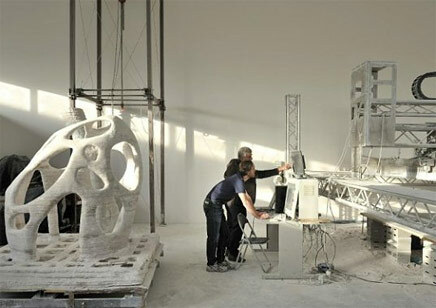 Digital fabrication is here for a while, but big digital printing not. So, wait and see and we'll be able to print out buildings! Which sounds quite exciting I admit!